A tear drop pearl in the Indian Ocean, Sri Lanka is a tropical paradise filled with beauty, unspoilt nature and an ancient history dating back over 2,500 years. Combining a sense of serenity and peace with thrill and adventure, this island will allure you with its mystical charm and release you with a lifetime of memories. The devotion to protecting the huge array of spectacular wildlife on this island has been deeply integrated in Sri Lankan society since the 3rd Century BC, when the first Buddhist monarch established the world’s first wildlife sanctuary. Sri Lanka has been recognised as a place of intense biodiversity, with the Sinharaja Forest Reserve listed as a UNESCO World Heritage Site. Home to hundreds of species, Sri Lanka is a haven for animal lovers. The five most magnificent mammals in Sri Lanka are the Blue Whale, Sperm Whale, Leopard, Elephant and Sloth Bear. Millions of people from around the globe come to Sri Lanka in search of these elusive creatures for the unique experience of seeing them in their natural habitats. Watch the Sperm Whale hunt for giant squid in the deep seas off the Kalpitiya Peninsular; stay alert in the Wilpattu National Park for a sighting of the mysterious leopard lurking in amongst deer, jackal and buffalo; observe one of the 12 magnificent Asian Tusked Elephants in Yala National Park as they playfully wash in open lagoons, but also be patient for the shy and nocturnal Sloth Bear to emerge from its secluded den; and in the Mirissa Fisheries Harbour witness the mammoth Blue Whales as they swim around the one of the best whale watching spots. Nurturing such a diverse array of wildlife, Sri Lanka is a rare place where you can witness the largest mammals in the world tremor the earth and waters, then two minutes later venture through the wetlands near Colombo and see butterflies flutter their wings in a tranquil silence. Flying through the trees in the World Heritage Sinharaja Rainforest and the Horton Plains National Park are many rare endemic species, with names as colourful as their appearance; The Indian Palm Bob, The Dark Palm Dart, The Rustic, The Blue Admiral, The Hedge Hopper, The Blue Mormon and The Red Helen. Also inhabiting the wetland reserves are 435 different species of tropical birds, a staggering population for such a compact island. With no less than 33 indigenous species to seen nowhere else in the world, lovers of the feathery friends will be fascinated by the ‘Rainforest Rainbow’ in the Sinharaja Rainforest, the largest and most studied mixed species flock, and the Bodhinagala Forest Reserve, known to inhabit the scarce endemic Green-Billed Coucal. Sri Lanka’s bird sanctuaries are rich with endemic flora and fauna, such as the Kelani Valley Forest Reserve, home to the Spot-Winged Thrush, Sri Lanka Blue Magpie and the Brown-Capped Babbler. The beautiful island of Sri Lanka invokes imagery of pristine beaches on the fringe of rural villages still following ancient Buddhist traditions in peaceful harmony. While this is still very much the case, Sri Lanka is also a thrill seekers paradise, with incredible opportunities to camp, trek, raft, canoe and kayak. Take to the roaring Kelani River strewn across the boulders at Kitulgala for an exhilarating session of white water rafting. 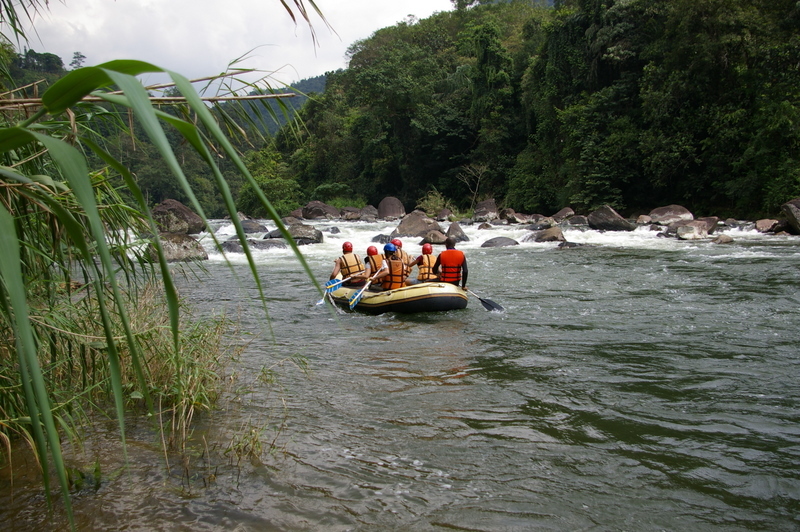 The adventure deceitfully begins in gentle waters surrounded by luscious tropical rainforest, before you’re suddenly hit by intense rapids. Navigate your raft through the Virgin’s Breast (simply the name of a rapid, no silly ideas please) and battle through Butter Crunch before you reach the infamous Killer Fall; a sudden 90 degree drop followed by fast churning waters. If you’re feeling rather adventurous, ditch the paddle and discover the thrills of body rafting at the gentler patches through Kelani. However, for those satisfied with their adrenaline rush, you can enjoy a canoe trip around the calm lakes in Ella and discover the enchanting panoramas Sri Lanka has to offer. Paddle through the waterfalls or skirt the lakes borders to watch the wild animals as they blissfully hunt, play and roam through the beautiful terrain. If you’ve ever said ‘I’d do anything for a cup of tea right now!’, then would you trek to the heart of Sri Lanka to the Bogawantalawa Valley; the Golden Valley of Tea, through 200,000 hectares of rolling tea hills? Well you should, because the Tea Country is the most scenic part of the country; breathtaking mountain ranges, tumbling waterfalls and charming ravines. Such captivating beauty, it inspired Sir Thomas Lipton, who would gaze at the sublime views from what is now known as ‘Lipton’s Seat’; the highest point in the region. The beauty he fell in love with has remained to this day, and the tea hills are Sri Lanka’s most significant landmark. Follow the trails of ancient Ceylon’s, trekking through dense jungle as you discover where they walked, planted and plucked. Along your journey you’ll also witness today’s humble tea pluckers picking ‘two leaves and bud’; the traditional ritual, and then see the 100 year old British machinery transform the buds into black tea through an unchanged artisanal process. Indulge in a tasting session where tourists are given different grades and flavours to sample, the perfect end to a long day! Within the tea trails are the four bungalows of colonial era tea planters; revamped to a five-star standard but still retaining their unique charm, these bungalows serve as luxury accommodation for tourists venturing through the beautiful Tea Country. This majestic islet of the Indian Ocean is a land whose natural landscapes are of the purest in the world, providing outstanding scenery alongside thrilling adventures of discovery. Enhance your inner explorer and set sail for Sri Lanka! Part of the Jetwing conglomerate, Eco Holidays is a tour company that cater to specialist travellers with niche interests that feel the bigger tour companies don’t have time for them. Operating in small groups to provide a more intimate touring experience, Jetwing Eco Holidays lead eager tourists to explore the beautiful country of Sri Lanka, guiding them and educating them on the wildlife, history and culture. Ecological and ethical values are at the heart of what Jetwing Eco Holidays’ stand for; emphatic that the local suppliers they use are paid fairly for their exquisite services; and devoted to the welfare of wildlife and plantation on the island, only choosing suppliers that match their criteria. A significant portion of the company’s time and profits are graciously allocated to the conservations on the island so that future generations can enjoy the beauty of Sri Lanka. The dedicated team of staff comprise of English speaking wildlife and nature enthusiasts who have years of experience in their specialist fields, offering a fun, friendly and interesting tour for all travellers. Combining their expertise in the travel and hospitality industries, Jetwing Eco Holidays provide a unique and unforgettable trip, leaving every tourist breath taken and craving to return to the Pearl of the Indian Ocean. Ganganath Weerasinghe graduated with a degree in Commerce from the University of Peradeniya. In his lengthy career in Tourism in Sri Lanka, he has worked in some of the leading travel organisations. He likes reading books and sports during his free time. The Jetwing Eco Holidays team comprises of some of the most experienced travel and hotel personnel in Sri Lanka. The Directors are all personally interested in wildlife, culture and conservation, and attach a lot of importance in developing the company as a responsible, community-orientated company. The Directors and staff travel regularly within and outside Sri Lanka, and are able to keep abreast of changing needs of eco and adventure travellers. As the Jetwing staff have a personal interest in many of the activities on offer, clients can expect a high degree of empathy. Jetwing Eco Holidays featured in the iGap Travel Guide Global Edition 2013 which can be found here.